The bulk of these letters were written to Richard Heber, son of the Reverend Reginald Heber of Malpas in Cheshire. Richard was a renowned bibliophile and man of letters who had a great circle of influential friends. One of these friends John Stonard, was tutor to the Stanhope family and presumably this was the reason that James Stanhope wrote occasionally to him; but by all appearances he never wrote back. The Honourable James Hamilton Stanhope was born on 7th September 1788, the 3rd son of Charles, the 3rd Earl of Stanhope and Hester Pitt (daughter of William Pitt, 1st Earl of Chatham). He joined the 1st Foot Guards as an ensign on 26th December 1803; but his advancement was far from meteoric, Lieutenant and Captain 14th January 1808; Captain & Lieutenant Colonel on 25th July 1814; brevet Major 21st June 1813; brevet Lieutenant Colonel 17th March 1814. 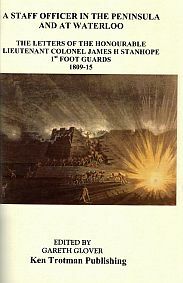 Following pressure from his sister Hester, James Stanhope became an Aide de Camp to General John Moore being present at the Battle of Corunna and was the last person the dying general spoke to. He then became an Aide de Camp to General Graham at Cadiz and then possibly seconded to Wellington and was slightly wounded at Ciudad Rodrigo on 14th January 1812. When Graham went home ill he went home with his general but soon returned and became ADC to Paget until his capture. He was appointed as a Deputy Assistant Quartermaster General and as such was severely wounded in the back at San Sebastian. He returned home where he was appointed Aide de camp to the Duke of York and then returned with Graham in the expedition to Holland. He appears to have served as an Aide de camp to Wellington at Waterloo but was subsequently appointed Acting Quarter Master General to Byngs Brigade. He married Frederica Louisa Murray, daughter of David William Murray, 3rd Earl of Mansfield on the 9th July 1820 but she died on 14th September 1823. Their only child James Banks Stanhope of Revesby Abbey was born 13th May 1821, who died unmarried on 18th January 1914. James left the regiment in 1822; he was placed on half pay on 28th February 1822 having exchanged to the 29th Foot only fourteen days previously; but the early loss of his wife, couple with his incurable wound, caused him to destroy himself while staying with his father-in-law at Caen Wood on 7th January 1825.